Soon Halloween will knock at your door with all its terror and haunting fantasies and it’s definitely high time to think about your spectacular Halloween makeup and unique costume! The best thing about the trick-or-treat holiday is that this is the only day of the year, when you can set your wildest makeup fantasies free and go out to the street resembling a wicked witch, a famous cartoon hero or a character escaped from your most horrific nightmares! And hell yes, we do love every little bit about these art-infused makeup imaginations, since they definitely color our lives and inject a high dose of excitement into the gloomy fall days! 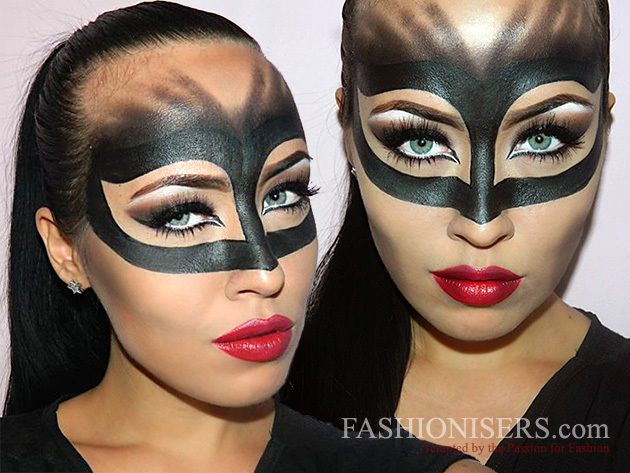 In case you seem to no longer have any bright Halloween makeup ideas, have a nosey at our coolest Catwoman makeup tutorial for Halloween! For an easy and less time-consuming Catwoman makeup look, you can simply pick a black mask and wear it, after you are done with the primary makeup look. However, let’s agree that drawing and painting it all on your own leads to perfection and a wow-worthy result! 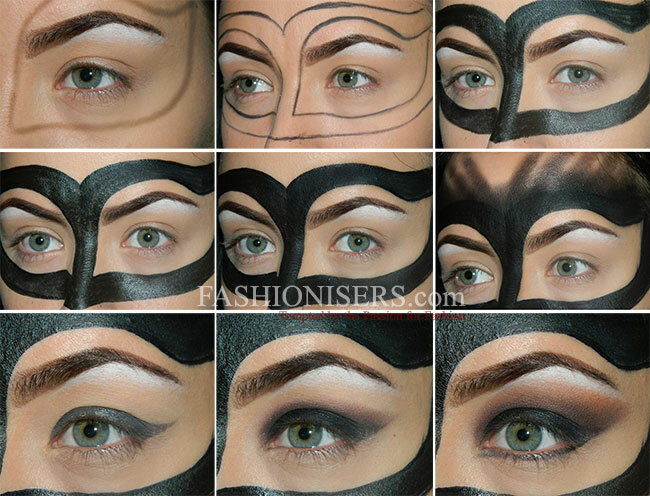 So here are the steps of the Catwoman Halloween makeup tutorial! Step 1: Like in the case of any ordinary makeup look, here too you should start from the base, that is your face. Wash your face gently, apply a toner and go for the makeup base. Apply the right foundation according to your skin type and tone and sculpt your face with bronzer and blush. Step 2: Contour your eyebrows and highlight the brow line. Step 3: Using a light brown eye pencil draw the cat eye around your eyes. Next, with a black eye pencil draw the contour of the mask. Fill the mask in with the same pencil. Using black eyeliner, contour the edges of the mask, making them sharp and perfect. Now, set the color with a black eyeshadow. Then, blend the lines with the same black eyeshadow to your forehead above each eye. Step 4: Apply a black cream eyeshadow to your lids. Next, apply a black and a brown/purple eyeshadow to the crease. Blend the colors with a warm brown shade and then with an orange eyeshadow. Now, apply a black cream eyeshadow to the lower lid and then a brown/purple color, blending the shades together, just as you did with your upper lid. Step 5: Apply black eyeliner and wing it to the inner corner of your eyes. Emphasize your waterline with a white cream eyeshadow. Step 6: Apply black mascara and false eyelashes for a sultry look. Step 7: Contour your lips with a true red lip liner. Apply a dark red lipstick. Finish off your lip makeup with a translucent powder for a completely matte effect!